Many people have heard of Capri through songs like "Isle of Capri" by Frank Sinatra or various rap songs that mention the island, but it's a popular location for both the rich and "rich enough" to get there. Just a 20-30 minute boat ride from Sorrento, you can spend a day or days on this gorgeous piece of Earth and see how the "other half" lives. Upon your arrival onto the island, you'll get off the boat at the marina and see lots of cafes. If you arrived early in the morning like my friend and I did, it's nice to stop and get some coffee and breakfast before heading onwards. 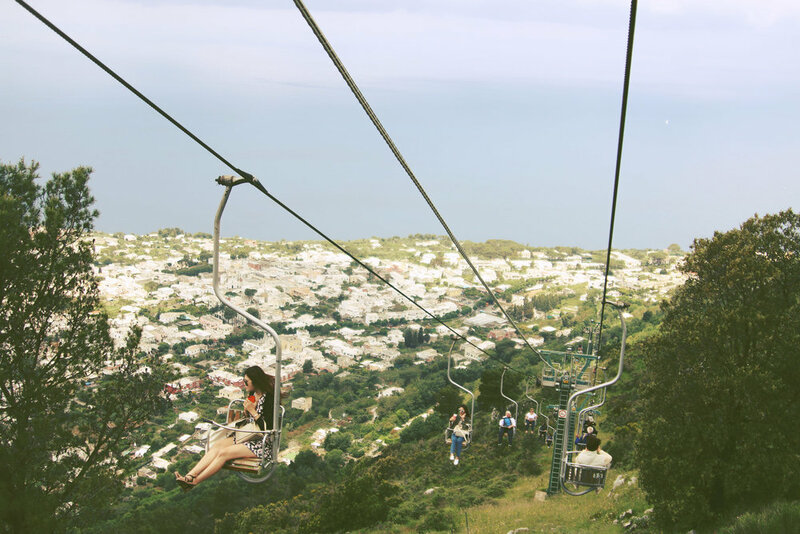 The first thing you're going to want to do is go buy tickets for the funicular that takes you up the hill to the main part of Capri. These tickets are €1.80 each way, so buy four (you'll need at least four). Once you get to the top, head straight to the small bus station close by and use one of the tickets you bought to board a bus to Anacapri. Once you get on the bus to head up to Anacapri, you'll arrive in 15 minutes to a cute town. The first thing you should do before anything, is head to the chairlift that takes you up to Mount Solaro. If you're not a fan of heights, the chairlift might not be your favorite thing in the world, as it takes about 12 minutes to get to the top, but it's a fun, slow ride that gives you great views. And at the top of the mountain, you'll see breathtaking views of the geography of the island below. It's worth the €11 to take some beautiful photographs. While Anacapri isn't known for it's expensive shopping like the lower part of Capri is, it's still a lovely place to walk around. There's colorful buildings, museums, places to eat and lots of cute cats lounging about. If you have €7 to spare, you can find your way to this charming villa that feels like you've stepped back into an old Italian movie. It also has some of the best views of the town below if you want to see blue ocean and tiny white buildings on an isle of green. After you've fulfilled all you needed in Anacapri, take a bus back down to Capri and see how the affluent folks live. There's no wrong way to enjoy this part of the island, so take a walk in the main square, walk into old churches, window shop at places like Louis Vuitton and Gucci, find restaurants that Beyonce and Jay Z have been too, and watch the sun set over the town below. At the end of the day, you might be rich enough to stay the night in a fancy hotel, but if you're not that classy, you can take the last boat back to Sorrento and watch the golden hour of the sun kiss the island as you sail away.